Designed retail and lower productivity tagging applications. The standard needle allows for the tagging of most products including, shirts, pants, jeans, hosiery, undergarments, bedding and towels, carpets, rugs and mats, and most other tagging applications. Uses our Tach-It SPS and SMS replacement needles. Accepts standard regular spaced fasteners (50 per strip) and micro-spaced fasteners (100 per strip) in either general purpose polypropylene or heavy duty nylon. Cap to protect the tagging needle and the operator when the gun is not in use. Uses a cutter style needle so every time the needle is replaced, the cutter is replaced. 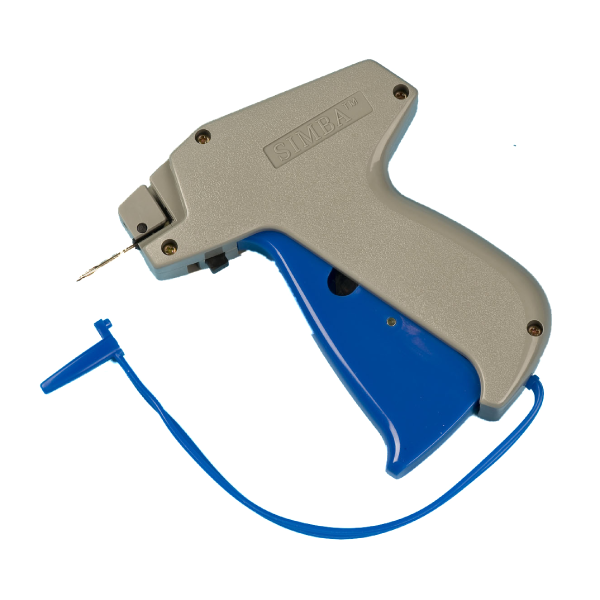 The Simba Standard Tagging Tool has a standard needle and is designed for lower productivity and retail applications. This tool uses all types of regular spaced or micro-spaced fasteners and the replacement needle is our Tach-It SPS and SMS Needles.